The Press-driven "legal-wranglin" roundup mayhem of the post-election campaign aside, it has never been so clear how detached our population is from public life. A collective shrug washes over the nation as the less-than-spontaneously protesting protestors "protest" in front of the sea of cameras. Half of eligible voters didn't think democracy immediate enough to their lives to trickle into their precinct to vote. Half could care less who runs the country. Half don't think the person at the head of the most powerful nation in the world will ever have an impact on their lives sufficient to formulate an actionable preference. For half of us, the very idea (and for some even, the ideal) of civic culture is dead--with a stake through its heart no less. For the rest it limps on, beset by the opiates of TV catatonia , bitter apathy, and futility. Whether a Cheney/Baker/Powell/OtherGuy administration or a Goretron2000 administration takes the reigns I am doubtful that any but the most insignificant steps will be taken to give our citizens much more than the illusion that their participation in public life will have any discernable impact on their lives. 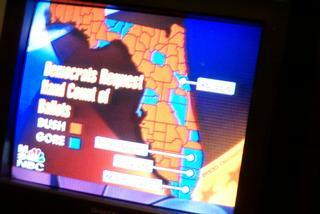 The presidency now hangs by a thread of 500 odd votes in Florida--essentially a within-the-margin-of-error tie. Either way we'll get candidates no one really wanted all that much, especially if you consider the real tie, that between the folks that voted and the 50,000,000 eligible that didn't even vote at all.